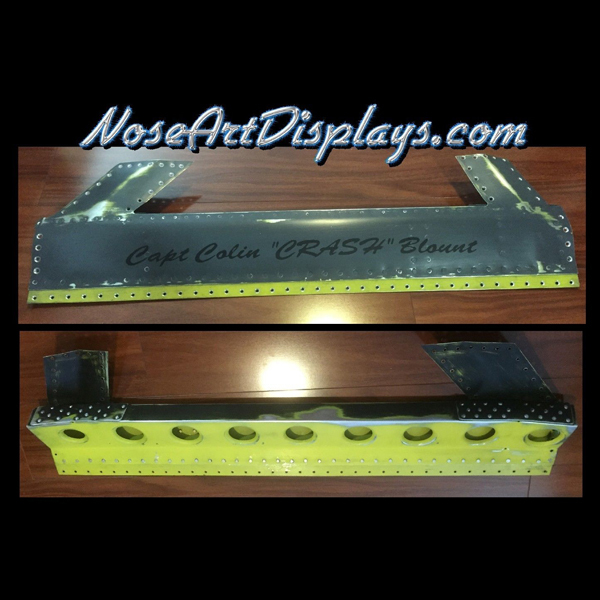 B-52 “BUFF” Bomber Pilot Window Name Panel reproduction. Hand made and made to order, with your choice of paint colors, Rank, Name and Call Sign. There panels take a few days to build due to custom painting and weathering. The ANGUS Call Sign pictures are un-weathered and the CRASH Call Sign photos are very weathered as requested by the pilot. I build these panels 1:1 scale and they measure 36″ long, 12″ tall and a little over 2″ thick. I just used photographs of the actual planes for size and rivet patterns. I’m also available to build anything you like as long as it’s Aluminum and Aircraft related. See my Other Items for some ideas. Made from .040 5052 Aircraft Grade Aluminum with tons of rivets and lightening holes, the back is typically painted Yellow Zing Chromate primer, but I can do any color you like. The US Air Force uses a dark gray color. I also drill out the holes of the counter sunk (flush) rivets which makes a bright silver aluminum color as one would expect to see if the panel had been removed from an actual B-52 Bomber. I can also make the window frame larger, any dimensions you like, just let me know and pay a little more. A perfect retirement gift for your Pilot, or anyone who wishes there were one. Hang on your wall and start talking about Military Service. Every pilot should have one to represent their aircraft and show pride in their rank, call sign and name! Thanks for looking, have a great day!